The movie award season is on it's way, actually the Golden Globes have already gone through. There are two films who seem to be competing to be the most successful in the major awards like the Globes and the Oscars. The films, of course, being Social Network and The King's Speech. I'm normally not big on award movies because they always turn out rather poor in my perspective. Titanic wasn't particularly good but it got all sorts of awards. Avatar on the other hand was groundbreaking and spectacularly gold but it lost out to some politically motivated Iraqi war film. Slumdog was ok but not enough to pick up so many awards. I didn't get a chance to write my thoughts about the Social Network, which takes us on the journey of the creation of the world's most lucrative social website. I think I must her watched it at least a good five or six times nevertheless. It's really insightful about the person behind the website nearly all of us spend some time on every single day. Go watch it if you haven't yet. But this entry is about The King's Speech. The movie picked up as many nominations in the Globes as Social Network, but Network got them all except Best Actor which went to Colin Firth - and deservedly so! I didn't know what to expect because I didn't know the story behind this whole thing. My historical background of the modern British Monarchy starts at around the time King George VI died and Princess Elizabeth took over the Empire. 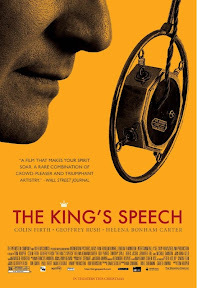 So it wad quite hard for me to imagine how they would write a script for a full length feature film depicting a stuttering King who couldn't give speeches. To my surprise, though, the movie turned out to be far more interesting. It gives an insightful look behind the scenes of how member of the Royal Family are, well, not so different from every dysfunctional family in the world. It also showed how little medical science and psychology moved in the early parts of the 20th Century. Psychology is a big part of raising children, an it never helps if the parents are never around and gives the task to nannies. The movie could have turned out pretty dry and dull. It didn't. The script was witty and the speech therapist, played by Rush, was simply phenomenal. Yes, Firth had a difficult role to play, but Rush was just so boyant it was a special thing to watch. All in all, it was fascinating to see the events unfold even though you inevitably know where it ends up and how it does. When it still keeps the audience interested, that's what marks a good film. I think I'm starting to change my mind about award movies. Maybe they judges and panels have moved on... I'm sure it will do well at the Oscars since it did rubbishly at the Globes. Highly recommended.